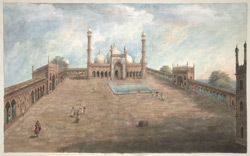 Watercolour of Jami Masjid in Delhi from 'Views by Seeta Ram from Gheen to Delhi Vol. VI' produced for Lord Moira, afterwards the Marquess of Hastings, by Sita Ram between 1814-15. Marquess of Hastings, the Governor-General of Bengal and the Commander-in-Chief (r. 1813-23), was accompanied by artist Sita Ram (flourished c.1810-22) to illustrate his journey from Calcutta to Delhi between 1814-15. The Jami Masjid is the largest mosque in India with its courtyard measuring 300 ft. It stands on a natural outcrop of rock which dominates the city and took 5,000 workmen six years to build. It functions as a congregational, Friday (Jami) mosque. The mosque is on the western edge of the courtyard and steep flights of stairs lead to the three huge gateways on the other sides (one seen in this view). The façade screen of the mosque is faced in red sandstone with extensive white marble trim. It contains eleven arches, the central one being an extremely large iwan. A tall minaret stands at each end of the screen. Three bulbous white domes cover the mosque, each decorated with thin vertical black stripes. A water tank at the center of the courtyard allows members of the congregation to wash before prayers.